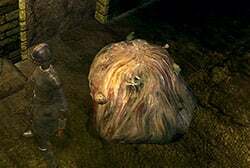 Slimes is an Enemy in Dark Souls and Dark Souls Remastered. Enemies are hostile creatures that respawn when players rest at a Bonfire or upon death. Special enemies that do not respawn are classified as Bosses, Mini Bosses or Invaders. These slimy creatures hang on the ceiling in some areas of the sewers and can fall on your head causing excessive damage. When on the ground, their slow movement and attack speed make them more of a nuisance than a threat. They are however, resistant to most melee attacks. The slimes sometimes cling to the ceiling, particularly outside of the sole bonfire in the Depths. They can fall on you if provoked or if you acquire the Large Soul of a Nameless Undead which is located near the bonfire. Note that once that consumable soul is acquired, all slimes in the hallway leading the bonfire will drop to the floor, making the trek back to the bonfire slightly more hazardous. Engulf: The Slime drops from the ceiling onto the players head. The player is then suppressed, and takes heavy damage over the next few seconds. Slime Stab: (melee) The Slime inflates and hits the player with puncturing spikes. Body Slam: (melee) The Slime Inflates and topples over onto the player. Be careful. While the slimes are relatively easy when on the ground, their ambushes can be quite dangerous. It's a good idea to keep your eyes on the ceiling and make them fall with a ranged attack before they get a chance to jump on you, or run under them and quick step out of the way before they can engulf you. If you get caught in their engulfing grab attack, repeatedly press L1/R1 (LB/RB if on Xbox) in order to escape almost unharmed. Once on the ground, slimes have high defense, meaning they will likely take a long time to kill, but they move very slowly and telegraph attacks. This makes for an easy, if slightly tedious, kill. They are very weak against fire, but any decent weapon (fire or not) should be able to make short work of them. The combustion pyromancy is very effective and efficient for farming. A great place to farm Large Titanite/Green Titanite is the bonfire above the large rat's area. From bonfire run and kill torch wielding zombie, than run down the corridor and 6-7 slimes will drop down behind you. Kill the other zombie than turn around and harvest them on walk back to bonfire (covetous serpent ring works wonders). While using Covetous Gold Serpent Ring this is an awesome place for farming both Large Titanite Shards and Green Titanite Shards!